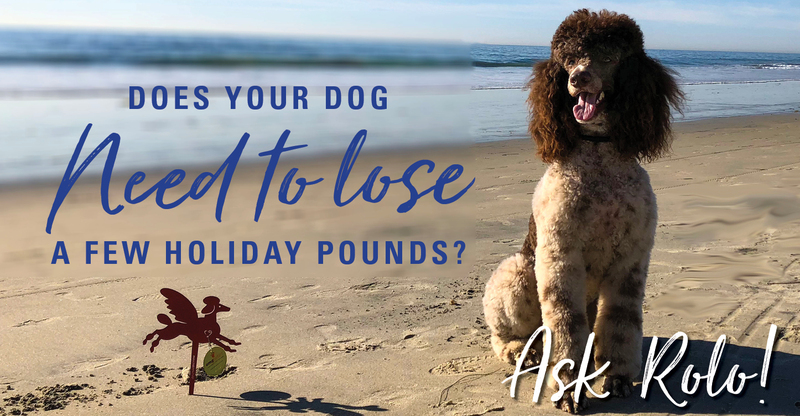 Do you have any suggestions for losing some of these extra holiday pounds? My new designer harness is now tight, and I bulge all over. Too many peanut butter-flavored treats and other goodies are showing up on my body. And not in a good way. Help! I know what you mean. And think of those colorful Holiday cookies sitting on a platter on top of the coffee table when no one’s around…what’s a dog to do? You need to think positive. I recommend going for a walk/jog/run along a beach. Or just staring at the waves is nice too. Also, entice your humans into playing fetch. If you really want to get them started on the laugh-track, try out some circus routines. You know, the jump on the couch, then off. Repeat 3-5x then run full speed at something and turn at the last minute. You know, that whole “ping-ping” pinball in the living room trick. I think if all our 4 legged friends did this little trick, we’d have a blast! Get your humans into the act. They’re pet lovers. Get them throwing a ball, a sock, anything. Get them laughing. They love the bonding. Whatever it is you decide on, you’ll do good. Be large and in charge, like me. Be a good dog!